I was out on a typical low-sec solo roam in my Firetail when I saw a self-named Drake on d-scan. He wasn't in line with any of the celestials or asteroid belts in the system, so I had my alt drop combat probes and quickly scanned him down. He was at a data site with a Magnate. This is very odd. Although I could tell from local that both of them were in the same corp, there is still absolutely no reason at all for a Drake to be at a data site. For him to also be in a self-named ship also shows that he probably has very limited PVP experience. For these reasons, I didn't look at this fight as "a Firetail vs. a Drake". That's a fight that's un-winnable for the Firetail. I instead looked at it as a fight between me, and someone who probably doesn't know what he's doing. That's a scenario that's potentially winnable no matter what ship I'm flying. Without any hesitation I warped to the data site to engage. After I landed, the magnate quickly died after only a few artillery volleys. I pointed the Drake and set an orbit for 20 km in order to maximize my speed. This is critical against missile-based ships, especially ones that are likely fit with either Heavy or Heavy Assault Missiles because they typically have trouble dealing damage to small targets. It worked like a charm. He began firing at me, but his missiles barely touched my shields. After I shot down his drones, I was more or less able to perma-tank his DPS. 1. Turn off all modules (including guns, missile launchers, webbers, scrams, etc.) and recall all drones. Stop your ship. 2. From the time a ransom amount appears below, you will have 30 seconds to pay the amount specified. Right-click the picture of the pirate stating our demands and select "give money" to do this. If you do not comply immediately, we will re-open fire on your vessel. If we get nervous for any reason we will re-open fire on your vessel. This is an empty threat on my part as I have no suitable alts that I can log on. Also, I again fail as a pirate. I offered a lowball ransom partly because I had very little leverage at the time, and partly because I've still never managed to successfully ransom someone. 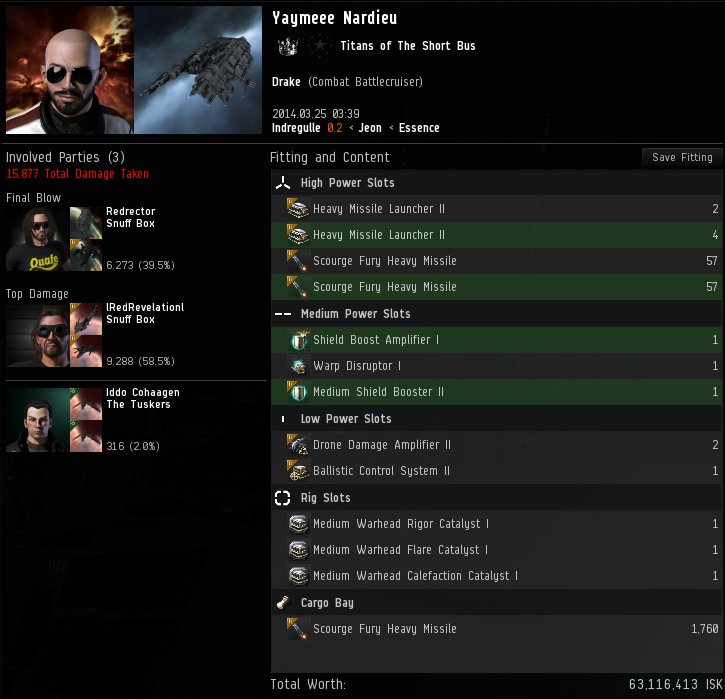 The deal was actually pretty good for him, since a fully-fit Battlecruiser will cost somewhere around 70M isk. He was certainly right about one thing though: he had LOTS of missiles with him. I really was struck by how much ammo he must have been carrying. He'd been shooting me for almost 20 minutes straight, stopping only to reload. He still wasn't able to break through my shields, thanks to the Firetail's natually high speed and small signature radius (and maybe Skirmish links had something to do with it too...heh..heh). [03:18:32] Iddo Cohaagen > seriously, how much ammo DO you have? As time progressed I was starting to give up on scoring the Drake kill. The best I was hoping for was that some of his corp mates would come to his rescue and give me a decent fight. At the very least the guy piloting the Magnate that I destroyed could have reshipped. Alternatively, the guy could very well have gotten bored and decided to pay the ransom after all. There were still plenty of good reasons to stick around, and I wasn't in any real danger. Pretty soon though, I finally got a response in our public channel. Redrector, a member of Snuff Box, was only 5 jumps away and was all too happy to help rid the universe of another purger-fit Drake. He landed on grid with me in a Vexor within a couple minutes. I was feeling pretty pleased with myself. It may have taken half an hour, but perseverance really does pay off sometimes! A few minutes later it was apparent that we STILL did not have enough DPS to break through his tank. I may have only been dealing 120 dps with my kite-fit frigate, but he was using a mixed flight of drones, including two Ogre II's. His DPS must have been at least 500, and probably closer to 600. Now I see why Drakes are so popular for running missions. Bad news for us. Not only that, but the Drake had switched targets to Redrector's Vexor. He was not able to signature-tank the missiles as well as me, and was soon forced to pull out of the Drake's missile range. Unbelievable. Not only did I have to batphone another corp to help me kill a damn Drake, but it's starting to look like failure is a real possibility. Fortunately Redrector DID have another PVP alt that he could log on, and he was just as determined to finish this as I was. His alt was on his way with a Vagabond. I had been spamming short d-scan regularly up to now, fully expecting backup to arrive. Right as I saw our Vagabond enter the system was when I saw another Drake appear on d-scan. The timing could not have possibly been any better. Red saw his backup coming too and immediately tackled the 2nd Drake. 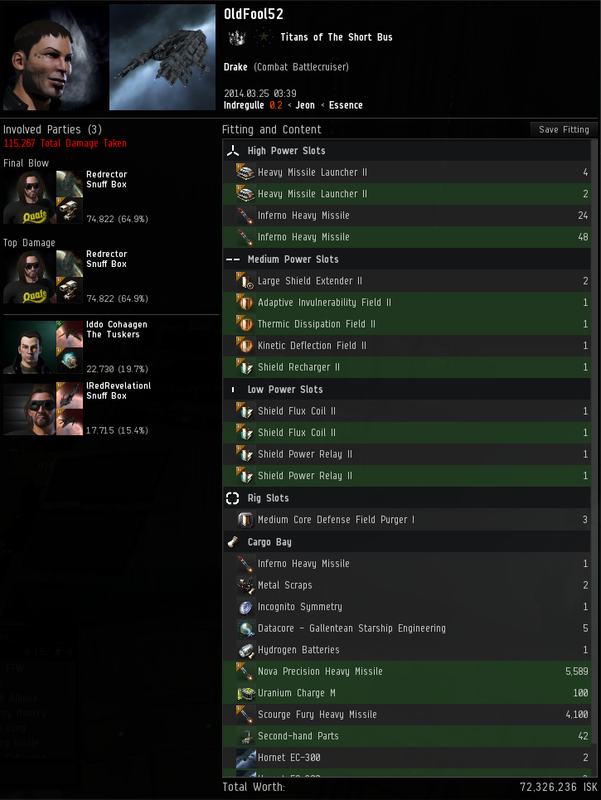 Now that we had sufficient DPS on grid to break their shields, the fight was over very quickly. Killmail for the first Drake. Look at how many missiles he STILL has left! Thanks Drakes for one of the more interesting and memorable encounters I've had in a while, and thanks to Redrector for the backup!